Good Vs WeEvil! - The Weevily Gang - BinWeevils Help Site And Designing service! You found Pumpkin number 2! Quick, find the other pumpkins will ya? 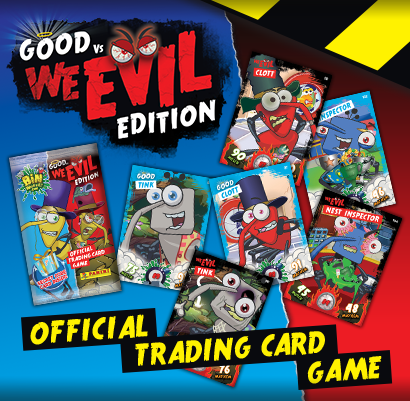 This page is going to tell you ALL about Bin Weevils Good Vs WeEvil! We will have help on the mission, info on the cards and much, much, much more! So first up lets talk about the Bin-Tastic Secret Case File (aka mission)) that you can play at Castle Gam! Wanna play the epic mission? Well head to Castle Gam and enter the HQ! Then while inside click on the books on the table that read "SWS CASE FILES". Now for the mission, we have a very handy guide for you, via our YouTube Channel: Gamingyoshi6601 - ENJOY the tutorial! 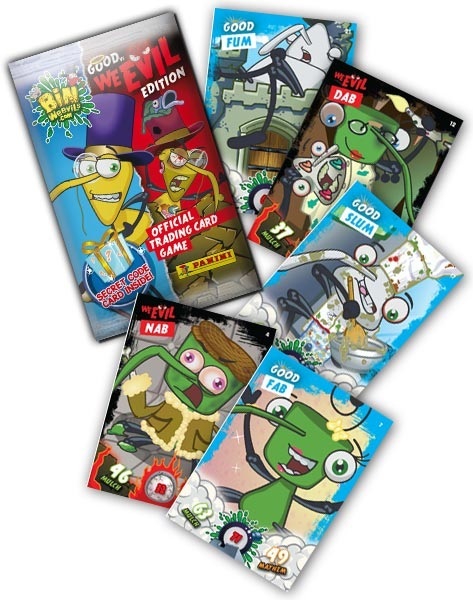 The Bin Weevils Good Vs WeEvil Trading Cards, are available at your local newsagents or supermarkets now! In total there are 200 cards to collect and the different types of cards include: common, foil, rainbow and code cards! An individual packet will cost 75p in the UK, and the starter pack will cost £4:99p in the UK. To celebrate the release of the trading cards, there was a small party outside Flem Manor! Inside you could receive an exclusive fan poster, enter a competition, have a boogie on the dance floor, complete a hunt and visit the official website! THIS PAGE IS PROTECTED! DO NOT COPY WITHOUT MY PERMISSION (YOSHI6601) IF YOU DO, YOU WILL RECEIVE A 6 MONTH BAN FROM OUR WEBSITE AND YOU WILL ALSO HAVE THE CONTENT COPIED TAKEN DOWN!